Since leaving my parents home I’ve always lived in small spaces. It was sometimes a challenge but you learn to get creative with space. 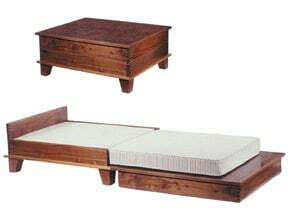 The most ingenious thing I’ve seen lately is the Coffee Table Bed by Julia West Home. It’s a good looking coffee table and quickly becomes a bed for one. Perfect for someone who doesn’t have a guest room. Julia West Home is located in Toronto and from what I can tell they don’t have an online shopping cart. They have other double duty furniture pieces on their site at JuliaWestHome.com. Check it out, dove-tail joints, I give this one a thumbs up.